7.30pm - Homemade chilli on the beach whilst looking at Durdle Door. This is our third short photography trip to beautiful Dorset. We will be staying just outside Swanage which gives us access to some great local beauty spots and fantastic walks too. My objectives are for you to take control of your camera by utilising Aperture Priority and/or Manual exposure modes so you can achieve consistently good landscape photographs. I will be helping with all the technical aspects of landscape photography, including using filters. I will also be able to help you with compositional and creative advice. Some of the sights to see are Corfe Castle, Dancing Ledge, Lulworth Cove and much more. The trip will be based around a two night stay with photography walks. It's a fun and social way to explore a very beautiful corner of England and photography tuition is on hand as and when you need it. The trip starts on the Wednesday evening (7.00pm) when we meet at the local pub (The Kings Arms, Langton Matravers) for a meal and to meet the other participants. On Thursday morning we will have an early start, meeting around 6am for a walk to Dancing Ledge. This is a lovely walk and we will have the possibility of a beautiful sunrise over the ocean. When we are ready we will head back for breakfast at our respective campsites or b&bs. After this first walk the day is yours until 3pm. There is lots to explore in the local area, such as Corfe Castle, and Swanage itself makes for a nice day out. We'll wait for the light to get a little softer before our next photographic outing. I have mapped out a rough itinerary for the days but this is subject to change depending on weather. At 2.30pm we will meet at the carpark above Durdle Door. We will walk from here to Lulworth Cove along the South West Coastal path which is about 1 mile. After spending a bit of time at Lulworth Cove we will then walk back to and down to Durdle Door for sunset. Around 7.30pm I will set up a camp stove on or near to the beach and serve chilli and bread rolls whilst we watch the sun set. 7.00pm - Dinner at a local pub. 6.00am - Walk to Dancing Ledge for some sun rise seascapes. 3.00pm - Meet at Durdle Door carpark for the next shooting session. 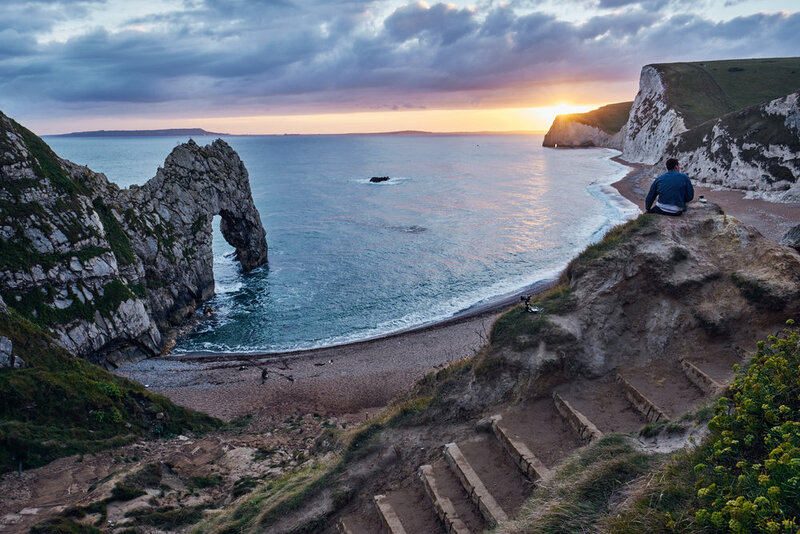 7.30pm - After sunset I will be serving home made chill and bread rolls on or near to the beach at Durdle Door. Of course if you want to extend the trip you are more than welcome to. Although I can offer advice on accommodation, ultimately it will be your own responsibility to book this for the entire trip. This workshop is for any level of photographer who wish to gain a better understanding of landscape photography. This workshop is best suited to those using SLR or advanced CSC cameras. The price for this photography trip is £149. Accommodation and food (except an evening meal of homemade chill served on the beach!) are not included in this price. You also have the option of paying a £50 deposit now and the balance by bank transfer 1 month before the course starts. The ability to walk 3-5 miles on fairly steep and at times, rough ground. We will be walking very slowly as we take photographs but a reasonable fitness level is required. For this course having your own transport is going to be best. Accommodation will be down to the individual to book and you can either camp or stay in a B&B. However, I am well aware that camping isn't for everyone! For that reason I have found a few B&Bs in the very close vicinity.